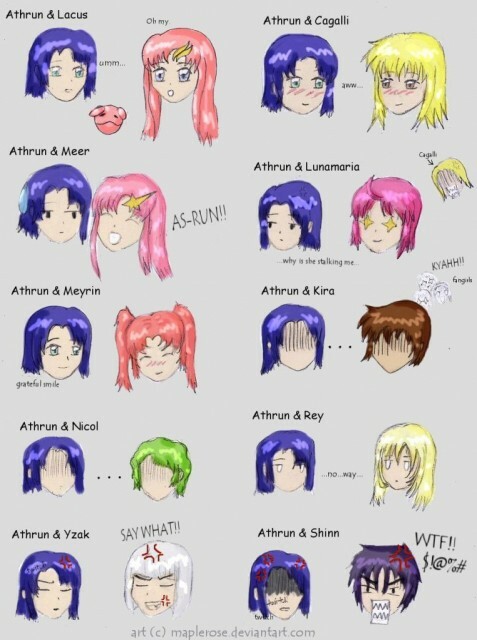 "Just what is it with Athrun that makes him so pair-able with other characters? You could pair practically anyone with him!" Ahah what a wonderful idea :D I'm not too familar with the Destiny characters, as I am still up to the Seed version, but I love what you have done here. 4 words. I can't bear it. It's too funny to resist! this is cute! =] i'm adding it to my favorites. OMG that is so cuuuuute! 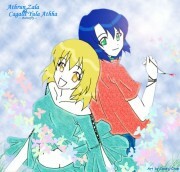 just what is it abt dear athrun that makes him so pairable? hilarious comments and expressions for each pair :D love the athrunshinn one! He is handsome but this is funny as in a good way. Maybe you should create a comic of your own.. lol! It was so fuuny, especially Arthrun with Yzak and Shin. It was a nice work!